A fresh coat of paint is one of the easiest ways to brighten up any yard. A crisp, white paint on a garden gazebo will make it pop against the flowers while maintaining a comforting, warm atmosphere. But if you’re feeling bold, consider painting your gazebo a bright red or teal to make it stand out. Hanging plants and bird feeders or planting butterfly-friendly flowers will turn your gazebo into a natural oasis for people and animals alike. You can also get a birdbath and fill them with flowers to give your garden a unique touch. This way, you’ll be able to enjoy the beauty of nature and the sounds of spring from the comfort of your own backyard. Hanging wind chimes from the roof or railing of your gazebo will help add another dimension of comfort to your personal oasis. The sound of wind chimes can be soothing and will make for a perfect addition to an already calming atmosphere. Curtains and canopies are a great way to add an ethereal element to your gazebo, while simultaneously protecting yourself against the elements and insects. They provide you with shade during the summer months and can help maintain your privacy while you enjoy your backyard. Screening in your gazebo is a good investment that will protect you from the elements, keep you cool during the summer months, and keep you warm during the winter. It’s also a great way to keep the mosquitoes out. Adding a trellis to your gazebo combines the privacy of the curtains with the airy roominess of the screen. It’s a unique look that will work with most gardens, especially if you add flower boxes or crawling ivy to the trellis. 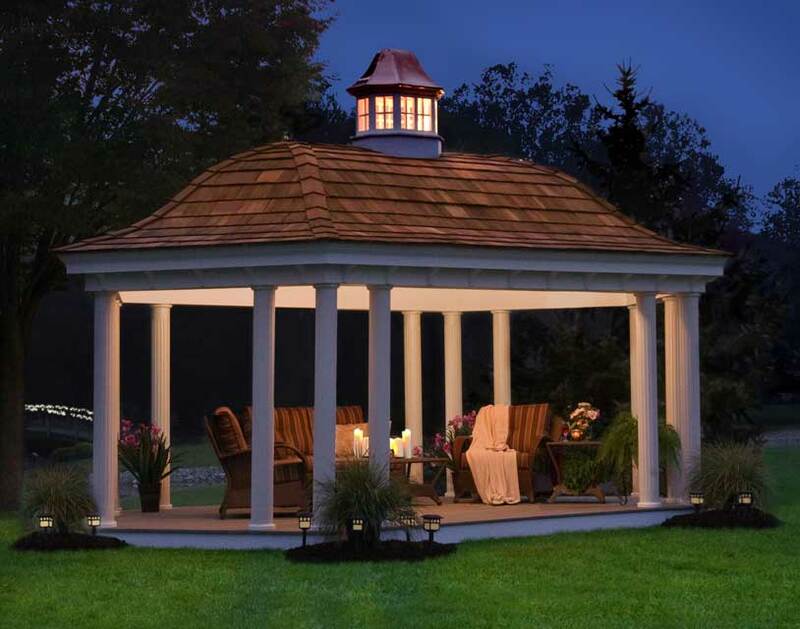 With its unique dimensions and stylish overlay, a peaked roof gazebo will call a lot of good attention to your yard. Just consider what you want to use your gazebo for, as peaked roofs look better on smaller gazebos, which may not be ideal for entertaining large parties. If you plan on doing a lot of entertaining outside during the mild months of spring, summer, and fall, adding a nook for your grill will be the perfect addition to your gazebo. With a nook, the gazebo itself should be larger, so that there’s enough room for a table and chairs to feed and entertain your family, neighbors, and guests comfortably. You want to make sure the view from your gazebo is relaxing. Avoid facing it towards the street or the neighbor’s yard and be sure to build it so you can see it from the inside your house. That way, even if you aren’t using the gazebo, you can still enjoy the view of it from your kitchen or bedroom window. Whether you’re thinking about building a gazebo or you simply want to update your existing backyard décor, these design ideas will spruce up any landscape. Even if you’re working on a budget, fresh paint, wind chimes, and birdfeeders are easy and inexpensive ways to add style and flare to your gazebo. So consider these ideas as spring comes around and you’re looking to spruce up your backyard.